Having grown up in the South, I always associate March with the onset of Spring, even though seven years of March in New York should have proven otherwise. By March, I imagine everyone is ready for a break from the cold (or, with this winter's wild weather patterns, just some reliably hot, sunny days). Now is the time for an end-of-winter escape where you can soak up enough sun to get you through the last few weeks 'til warmer weather arrives. 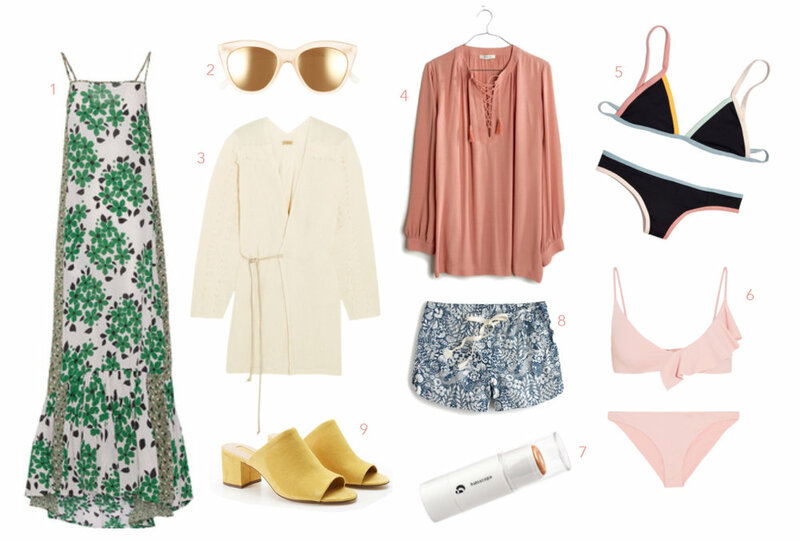 Here are some things I'd bring along on a trip to a tropical destination: A floaty silk dress in a fun floral pattern, a gauzy beach coverup that's cool enough to wear on and off the beach, and a couple of bikinis--including my favorite Tavik swimsuit. For a beach getaway, you always need a good pair of shades, and at under $70, your vacation won't be ruined if a wave takes these out to sea. A drapey lace-up peasant top and cute printed shorts are perfect for an afternoon of shopping and bright slides with a low heel are both on-trend and super versatile. And to top it all off, my all-time favorite highlighter in a subtle golden shade will make your fresh sun tan even glowier both while you're in paradise and once you return to reality.